Akinwumi Adesina, the president of African Development Bank (AfDB), has been named the 2017 World Food Prize Laureate. NAN reports that Adesina, whose name was selected on Monday in Washington DC, becomes the 46th recipient and the sixth African to be so honoured. The award ceremony would take place on October 19. Announcing the new laureate, Kenneth Quinn, the president, The World Food Prize, The Hall of Laureates, described Adesina as “someone who grew out of poverty, but whose life mission is to lift up millions of people out of poverty”. Over a 31-year existence, the award has become known as the ‘Nobel prize’ for food and agriculture. The announcement by Quinn was made at a ceremony held at the US department of agriculture, which was attended by US secretary of agriculture Sonny Perdue. Quinn said “These individuals have been at the fore-front of every major breakthrough in agriculture and food production in the last 30 years”. He said that the laureates had led the “single greatest period of food production and hunger reduction in all human history”. Also, Perdue, attesting to the good works of Adesina, said the new Food Prize Laureate could fit in as the US secretary of agriculture. In attendance were some past awardees, Nigeria’s former minister of finance, Ngozi Okonjo Iweala, Nigeria’s acting ambassador to the US and chargé d‘affaires, Hakeem Balogun. Others include officials of the World Food Programme, members of the diplomatic corps and other US officials. 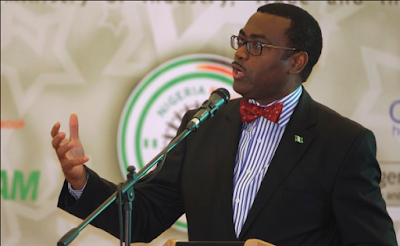 Adesina was the Nigeria’s minister of agriculture under the administration of former president Goodluck Jonathan.